Oliver Brown is a leading shopping destination for quintessentially traditional and contemporary ready-to-wear collections, bespoke tailoring, formalwear hire and luxury accessories. We specialise in designing collections of the highest quality, using cloths sourced from some of the oldest mills in the North of England and Scotland, manufactured in England. In Spring 2017, we were honoured to be appointed an Official Licensee to Royal Ascot, launching a capsule formalwear collection designed in collaboration with the world’s most prestigious racecourse, as part of a five-year agreement. For over thirty-five years the home of Oliver Brown has been in the heart of Chelsea at our Lower Sloane Street flagship store. In summer 2017 the store was expanded to double the size, introducing a dedicated bespoke and formalwear department. The unique space allows for our in-house, third generation master tailor Juan Carlos to cut and craft each bespoke garment in the middle of the store. This artistry can even be viewed from the tree-lined street outside - the only tailoring house in London to showcase bespoke craftsmanship in this way. Juan Carlos uses his experienced eye for detail to understand our customers individual style, taking into consideration their unique stature, balance and stance, to establish how the suit will be worn. All patterns are drafted by hand and constructed by using age-old tailoring techniques, resulting in an impeccable fit, precision and a clean-cut finish. Made-to-Order and Semi-Bespoke services are also offered, as well as Bespoke. 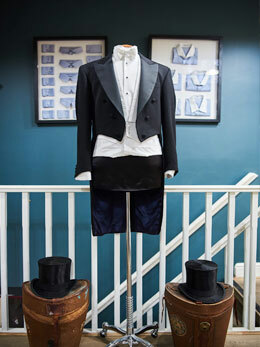 Alongside our ready-to-wear collections and personal tailoring service, we also offer a full hire service for our superbly tailored, traditionally cut morning and eveningwear collections, to include top hats. We are in fact the UK's most notable independent retailer of top hats, offering the largest collection of original antique silk toppers in the world. We are also proud to house the world's largest collection of velvet smoking jackets. Our experienced and knowledgeable team of stylists would be delighted to answer any requests or enquiries you may have, so please do contact us if we can help. We hope you enjoy shopping our collections online and look forward to welcoming you in-store next time you are in Chelsea.